LEVAILLANT - La Mésange noir. Fig.1 Le Mâle. Fig.2. La Femelle. Planche 137. LEVAILLANT, F. - La Mésange noir. Fig.1 Le Mâle. Fig.2. La Femelle. Planche 137. La Mésange noir. Fig.1 Le Mâle. Fig.2. La Femelle. Planche 137. - LEVAILLANT, F.
Title : La Mésange noir. Fig.1 Le Mâle. Fig.2. La Femelle. Planche 137..
Map maker : LEVAILLANT, F.. Size : 11.8 x 9.4 inches. / 30.0 x 24.0 cm. 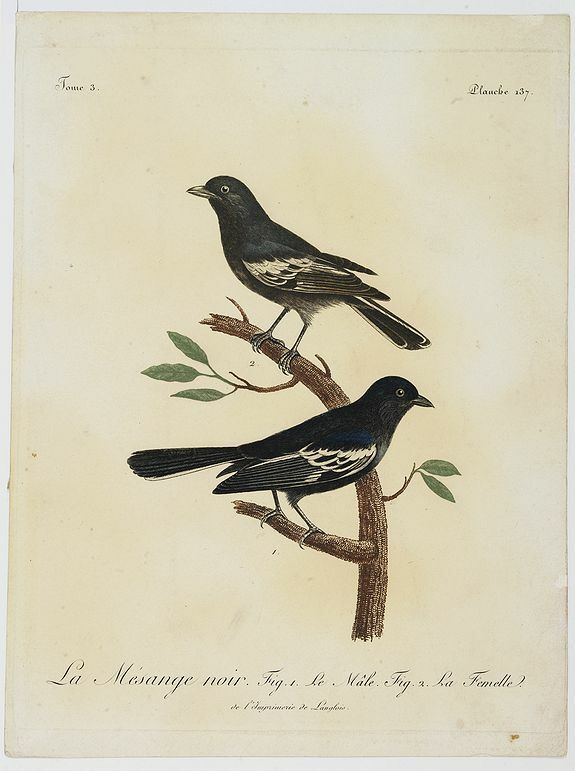 Description :Very decorative plate from Histoire naturelle des oiseaux d'Afrique , published by Delachaussée. Levaillant's interest in natural history led him to explore Africa as the least known continent. He arrived at the Cape of Good Hope in March 1781 and made two trips into the interior, undergoing many adventures and difficulties, not least from warring tribes. He returned to France with his collections relatively unscathed in 1784 and after a brief period of imprisonment set about writing up his work. His books, of which this is the most prominent, were among the first to reveal the wonders of Africa and of the tropics. With the mention De l'imprimerie Langlois . Condition : In very attractive colours. Paper slightly age-toned. Plate mark 30x24cm.